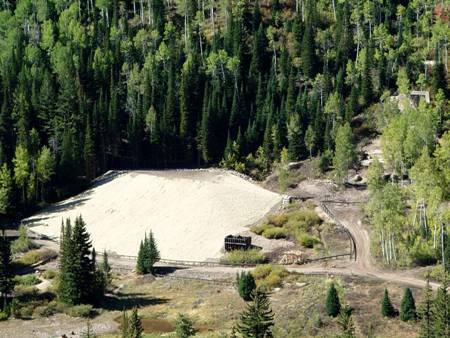 American Fork Canyon is riddled with mines and old prospects from miners who began filing claims there after the discoveries in Little Cottonwood Canyon in the late 1800's. 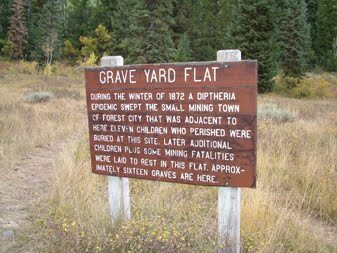 The remains of Forest City, a once active mining town located on Dutchman Flats in the upper reaches of American Fork Canyon, are all but gone and only the cemetery remains today. Most placer gold found here is extremely fine and even in the best areas you will only get a few specs per pan. 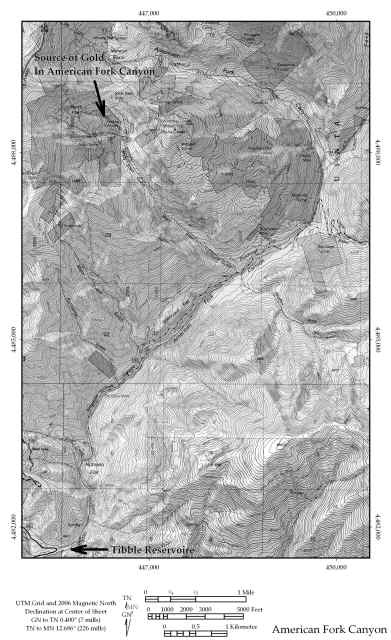 The map below shows where the source of most of the gold comes from in the canyon. With so much mineral in the area, why wouldn't there be Spanish activity here as well? One of our discoveries may prove that the Spanish were indeed in A.F. 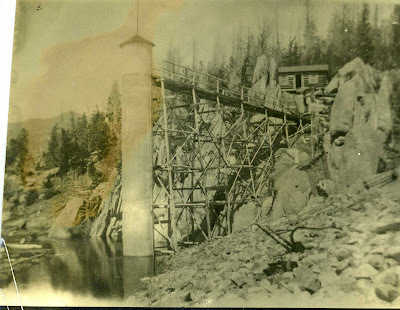 Canyon long before the settlers of Utah and Salt Lake counties. 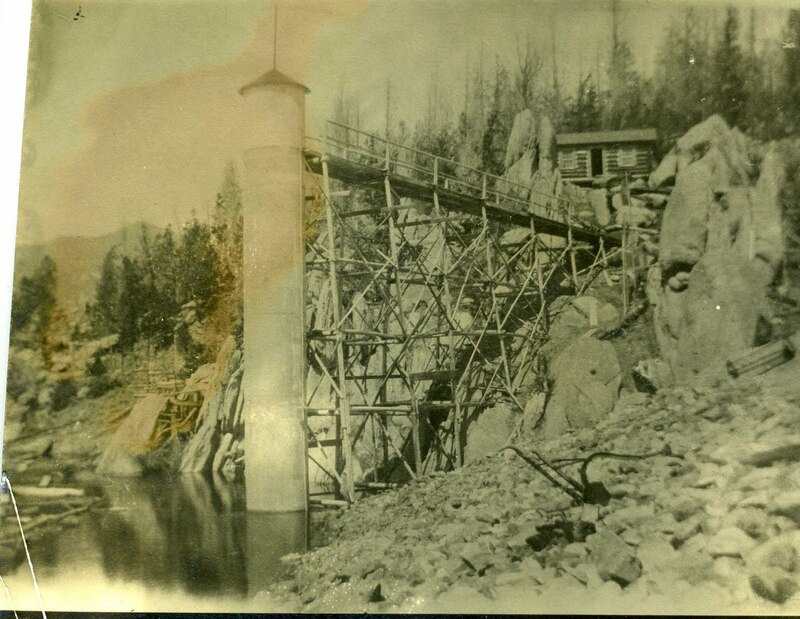 While most of the mines played out in the early 1900's, one still wonders if they were successful in recovering all of the precious metals from the canyon. 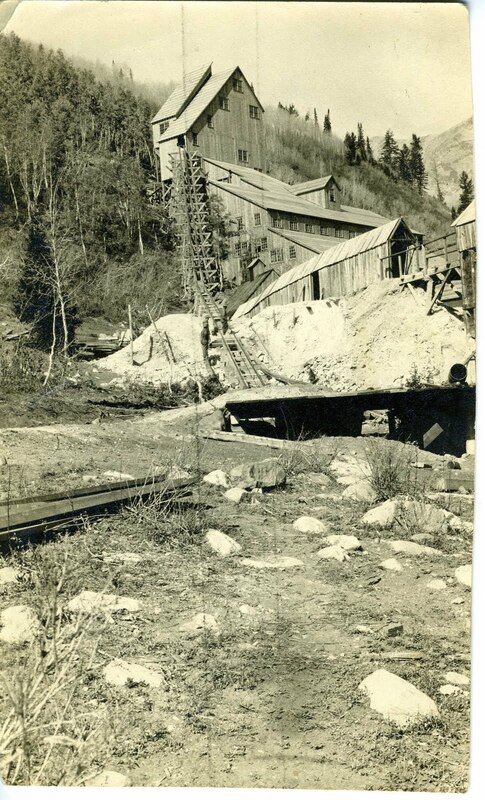 The Pacific mine is one of the largest mines in the canyon that was worked in the early 1900's. This is what most of the newer mines in the canyon look like. Large tailing piles, wooden structures for sorting and loading the ore and large, well defined roads or trails leading to them. The Pacific Mine as it appeared during operation. This mine is quite different from any others in the canyon. There is no trail or road to it, the entrance is very small and extremely well hidden and it appears to be a natural cave for the first 15' or so. After that you have to duck under a hanging wall, and then you are in a full blown mine tunnel. This entrance is typical of an old Spanish mine in that the entrance would be small to prevent enslaved workers from making a mass rush out the entrance and thus only one or two guards could be used to oversee the work. Steep incline down to the floor of the cave. Someone has run a hose back into the mine to try and syphon out water. In the spring time and even mid summer you are not able to go any farther than the natural cave because water levels are so high. There are several small formations growing on the ceiling throughout the mine. An old water wheel is uncovered when the water table is low enough. This is as far back as I have been able to go. Probably 150' back in, and only 20 or 30 feet down.There is an old wooden track running into the cave from this point. 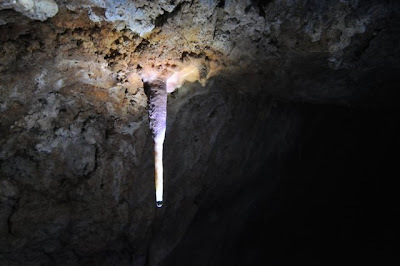 This cave was first discovered by two young boys named Dave and Nate in 1988. While exploring they found a flat rock that looked very out of place as it did not match the type or shape of rocks nearby. When they moved it they discovered it concealed the entrance to a natural cavern. This rock had definitely been placed there on purpose and the boys thought they might be on the verge of discovering a hidden treasure. The lighter colored rock is the original flat rock that concealed the entrance when the cave was first discovered. It is still used today to keep debris or large animals from entering the cave. Looking down into the cavern. 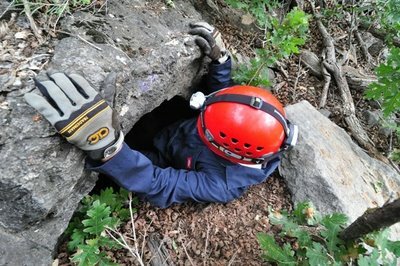 Michael Coles headed into the cave. After exploring the cave the boys did not find anything of value, but there are some nice formations inside. While exploring the area of the burned canyon mine we saw something glimmering on the edge of a high cliff overlooking the main canyon. As we got closer we found out it was a golden Buddah. Apparently someone has been doing some meditating here. A tree to the left is covered in prayer flags and there is a little ammo box with some books, snacks, and interestingly enough.... a He-man action figure inside.